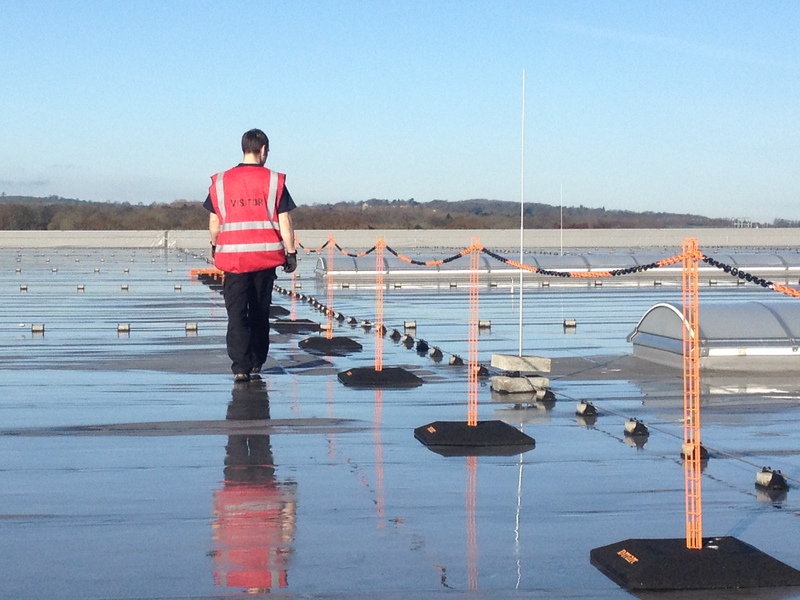 D-marc design and manufacture demarcation systems that give specifiers the confidence of knowing their roof top safety system has been tested to withstand the elements including strong winds. D-marc have developed a demarcation barrier solution for flat roofs as a form of collective demarcation protection. Flat roof demarcation can be used for the purpose of preventing access to hazards during regular rooftop maintenance. Wherever roof access is required designers are tasked with creating a safe route to and from the workplace and roof edge demarcation systems just didn't offer this anymore. Flat roof demarcation systems are wind resistant and vastly superior in sturdiness and strength, compared to roof edge demarcation systems. The D-marc 105 barrier system provides a collective demarcation protection solutions which is often a cost effective alternative to handrails / guardrails. It requires no specific training to install along with no drilling or bolting to secure it to the rooftop. In summary D-marc can be used to create a safe zone on a flat roof where ever the fall hazard is more than 2m away.